Bulgarian archaeologists have discovered a large public building dating back to the 4th-3rd century BC, the Early Hellenistic Period, during their 2015 summer excavations of the Ancient Thracian, Greek, and Roman city of Heraclea Sintica near the southwestern town of Petrich. The discovery has been announced by Assoc Prof. Lyudmil Vagalinski, Director of Bulgaria’s National Institute and Museum of Archaeology, as quoted by the Standart daily, who is also the lead archaeologists in the excavations of Heraclea Sintica. Heraclea Sintica was founded around 300 BC by Cassander, King of the Kingdom of Macedon (r. 305-297 BC), who also founded Thessaloniki. It was named Heraclea after the mythical Ancient Greek hero Heracles, also known as Hercules, and Sintica after the Thracian tribe of the Sintians who inhabited the valley of Struma River. The newly found archaeological structure is said to be valuable precisely because it dates back to the beginning of the Hellenistic Age. “This building is from the Early Hellenistic Age, the 4th-3rd century BC. It literally dates back to the very beginning of the ancient city. It lies at a depth of 8 meters. Its construction is exquisite. This find is huge success for us, there are very few such Early Hellenistic buildings found in Bulgaria," Vagalinski explains. “That’s why it would be a sin to re-bury and abandon it. It is a problem that a road passes by close above it but we are obliged to unearth it as much as possible, and to conserve it", he adds, assuring that his team will do all it can to preserve the ancient building, and will draft a project to make it accessible for tourists. The archaeologist has complained that despite the fact that Heraclea Sintica is one of the top cultural tourism sites in Petrich Municipality, the municipal administration has barely supported its excavations, and several times even misled the scholars by promising funding but failing to provide it subsequently. “I have been working on archaeology in Bulgaria since 1989 but I have not encountered such attitudes – misleading, or passive at best – in any other municipality in the country," Vagalinski told the Focus news agency in an interview. That is why the 2015 summer excavations of Heraclea Sintica will last for only 10 days – they are conducted with only BGN 10,000 (app. EUR 5,100) in funding from the Bulgarian Ministry of Culture. Vagalinski has explained that because of their limited funding and time, the archaeologists have focused on excavating an Early Hellenistic archaeological layer from the 4th century BC which shows evidence of two fires. He says the Ancient Thracian, Greek, and Roman city of Heraclea Sintica keeps getting attacked by treasure hunters because Petrich Municipality fails to provide proper security for the site. “We are not going to give up. We will continue with our research, and I will be seeking funding sources other than the Ministry of Culture. Last year, we had a good season, we excavated for 2.5 months, but this year, even though the Culture Ministry has larger budget, it has allocated much less money for archaeological excavations nationwide," concludes the archaeologist. 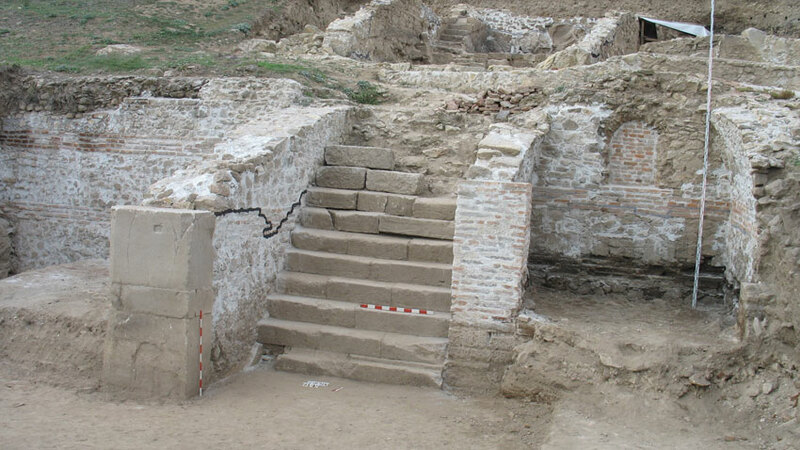 Regular annual digs have been carried out at the ancient city of Heraclea Sintica since 2007. For the first time in recent years, the excavations of Heraclea Sintica in the summer of 2015 were not funded by the American Research Center in Sofia, and no U.S. experts and students were be involved in the digs. In their recent excavations, the archaeologists have found hundreds of ancient artifacts at Heraclea Sintica located just 1 km away from the town of Rupite, which is famous as the hometown of Bulgarian clairvoyant Baba Vanga (Vangeliya Gushterova) (1911-1996); it lies at the foot of the 200-meter tall extinct volcano Kozhuh.